The two images which follow might stir emotions and feelings especially if you are an animal lover. They present a sport that is no longer valued in this country or time. Both are by artist Samuel Howitt. 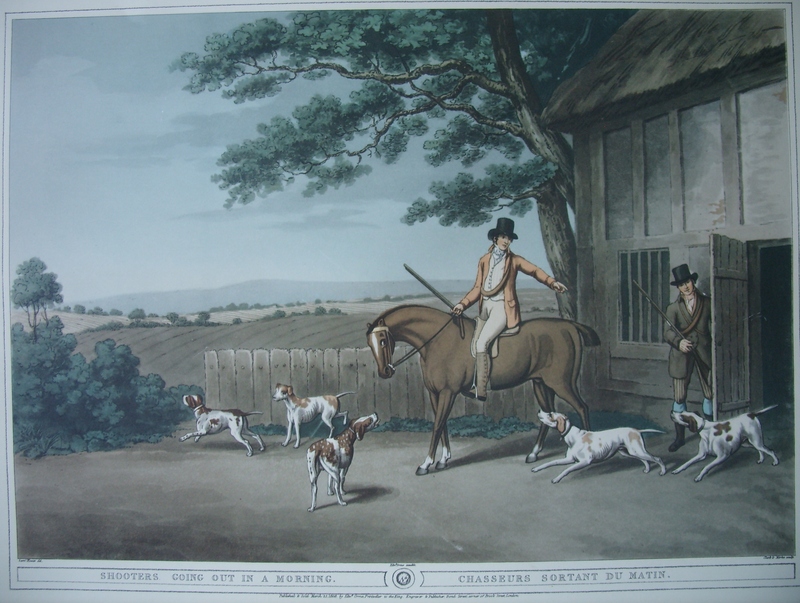 Samuel Howitt (1756-1822) was a painter and engraver of sporting subjects. His speciality of choice was hunting and shooting subjects. Howitt although an engraver usually did not do his own engraving. He simply drew the original picture from which Godby and Merke ( or others) then etched the plate. Usually Godby etched the outline and Merke did the aquatinting. Howitt, Godby and Merke worked together on Orme’s Collection of British Field Sports published in 1807. One of the truly important early sports books published. Samuel Howitt dd – J Godby & H Merke sculp. Samuel Howitt’s scenes of carnage which occurred at the denouement of the hunts are very popular in Europe but not so much here in England. We seem to have slightly different taste when it comes to the scene of the kill. The two prints, I picked up, have no carnage nor scenes of dogs tearing at their prey or even the slaughter of the quarry. Mine portray a more refined and sedate view of the sport. The first is of the hunting party after they have returned from their endeavours. They have been successful as can be seen from one person carrying a hare while another hare is tied to a saddle. Both prints’ have an image size is 305mm by 435mm or 12″ by 17″ in old school measurements. Samuel Howitt dd – Clark & Merke sculp. The second is of the hunts men just assembling their dogs prior to the start of the hunt. Both prints evoke thoughts of times gone by. A little of Downton Abbey possibly(popular TV show). Genteel times. The hares, foxes and stags which were hunted likely didn’t think so but mostly those days are gone. Quite a lovely pair of prints. 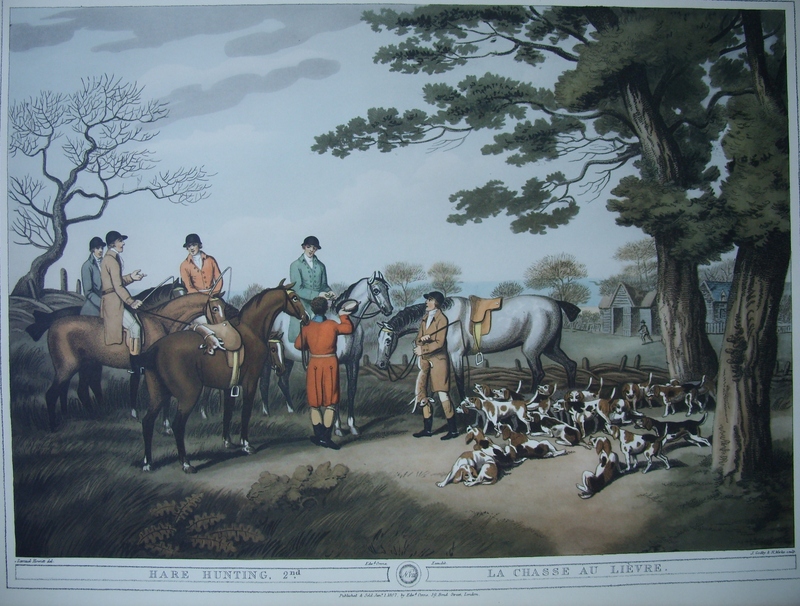 This entry was posted in Modern prints and tagged hare, hare hunting, horses, hounds, huntsmen, kennel. Bookmark the permalink. It would depend on whether your print is an origiinal aquatint or a more modern reproduction. if they are rare. Good luck.